PORT TOWNSEND — Sue Milliken & Kelly Dodson invited me out to their nursery, Far Reaches Farm, last week to photograph their Cardiocrinum giganteum var. yunnanense, the giant Himalayan lily, in full bloom. If you are not familiar with these towering, 15 feet tall beauties, they grow in shady woodland gardens and blossom up and down their floriferous tall stalks with many large, white, highly fragrant, lily flowers with streaks of burgundy in their throats. Once they flower, the plant dies—monocarpic plants. Offsets of bulbs will grow on to flower in a few years. Grown from seed, the plant will bloom in seven years. Planting seeds are an investment in the future! 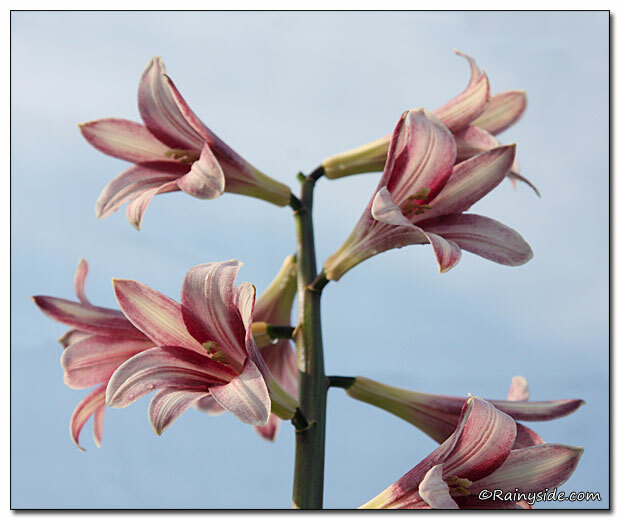 Nevertheless, the main reason I drove up to Port Townsend in Washington State, where the nursery resides, is that one of their towering lilies was blooming pretty in pink, a pleasant surprise for Kelly and Sue, who carefully selected their seed from the best plants. They are planning to propagate this one, but we won’t be seeing it offered for a few more years. Here’s a sneak preview of these unusual pink flowers, which I hope will be available in the not too distant future. May 19, 2013 — Update! 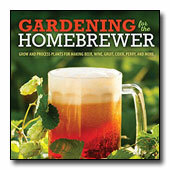 Five years after writing this I bought one of their seedlings at a Heronswood Plant Sale. This Cardiocrinum teaches me patience! 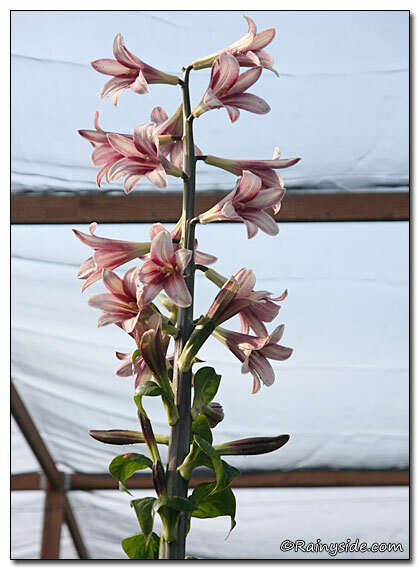 You can see it at Cardiocrinum giganteum var. yunnanense 'Big & Pink'.